Step 1. Download the ring size chart shown above as a pdf here. Step 2. Print out the pdf file at 100% for accurate scaling. At the bottom of the page you will find a ruler which should measure 7cm. Step 3. Place your ring over the circles on the chart. Make sure you match the inside of the ring to the nearest in size. If in doubt, we suggest you opt for a slightly larger size. Half sizes are determined if your ring size falls between two of the circles. Step 1. Wrap a piece of paper (about 1cm in width) around the base of your finger and mark it with a pen where the long end overlaps. Make sure you can slip it comfortably over your knuckle. You will get the most accurate reading if your hands are warm. Step 2. Use a ruler to measure the length of the string or paper. This is your finger’s measurement. Step 3. 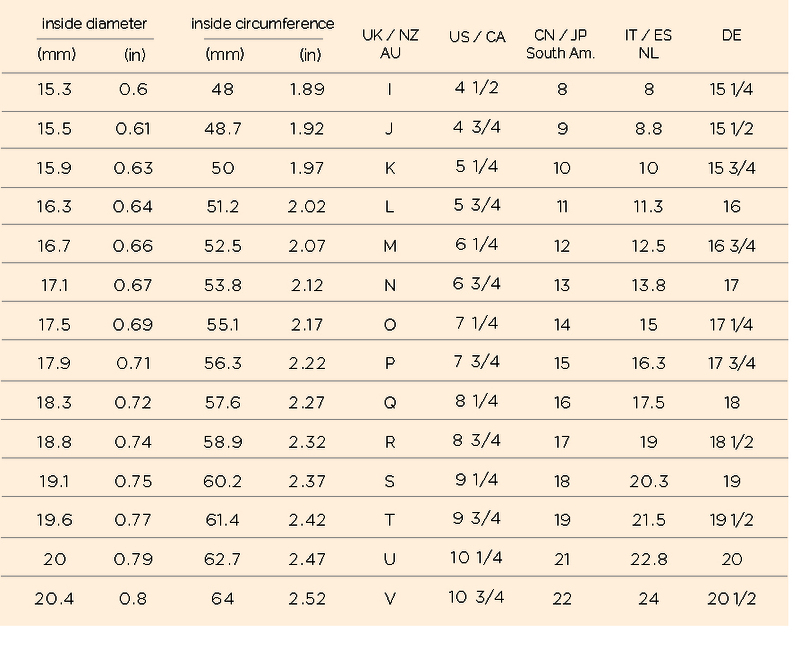 Compare the circumference in either inches or centimeter to our ring size converter chart below to find out your equivalent UK ring size.